Hi there Happy Monday to you ! Did you have a nice weekend? It's official, we've turned on the heater so it's really fall around here! There's plenty of leaves around, Bret vacuumed up a bunch but they'll be falling well into January. I managed to get in some sewing, and some pinteresting and some instagram watching. You know, the usual. Friday I was in Monterey and took a little trip over to the Pacific Grove Butterfly Sanctuary. 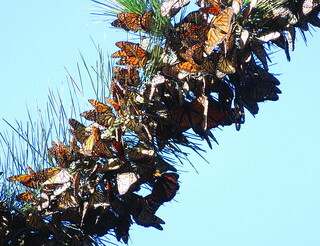 It's prime Monarch migration season, you can read more about that here as well as see some pretty spectacular photos. 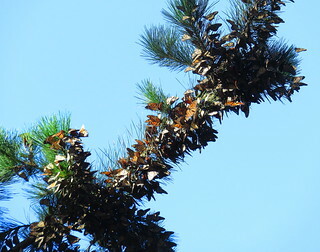 At first I thought there were far less butterflies than before, but then on the way back up the trail I saw more clumps of them hanging off trees in a whole different area than I was used to seeing them. They just look like dried leaves until the sun starts warming them up. It needs to be around 55 degrees I believe for them to start flying. I've mostly come in the mornings, but Friday I was there in the early afternoon. The docent was saying that there were about 8000 butterflies in the park, and they were expecting a record number this year. The bad news is that butterfly habitat is shrinking in the United States and Mexico. 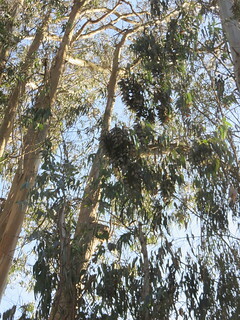 You can barely see them in this first picture in the eucalyptus trees, then close up you can see the big clumps of them. Farther down the path there is a pocket of sunshine.. usually you can see more of the butterflies down there, but not Friday. 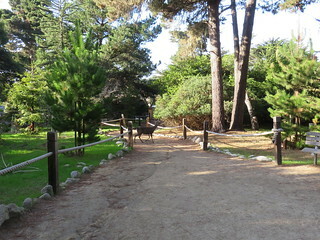 I did see some deer pretty close up. They're not tame by any means, but they aren't totally afraid of humans. Click over here to my picture on instagram. A doe just stuck her head out behind a planter, took a look then backed up. It was hilarious. I had seen her coming .. it's a chicken wire fence! 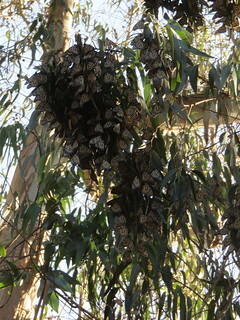 I have posted about the butterflies before, you can read those posts here if you're so inclined! It was cool in the little wooded area, lots of shade, but it was nice in the sun. The California Coast is nice in the fall. It was a good day out and about. Sounds like a perfect weekend PKM. I would love to see the butterflies. We got snow last night -- it's beautiful, but seems so early this year! As Winnie the Pooh would say, "Oh, bother!" I was told that Monarch Butterflies were extinct! So happy to find out I was mislead!